Ferrari's Fernando Alonso said the move in which Sebastian Vettel forced him on to the grass at 180mph in the Italian Grand Prix was "dangerous". The Red Bull driver was given a drive-through penalty as the move contravened guidelines introduced this season. Alonso said: "It was dangerous for the nature of the circuit. It's 300km/h and we were jumping on gravel. Not nice." Asked if the penalty was fair, Vettel said: "From my point of view, no, but it's not for me to judge." Governing body the FIA issued a clarification on driving standards following controversial incidents at the Bahrain Grand Prix in which Alonso and McLaren's Lewis Hamilton both felt Mercedes driver Nico Rosberg had been over-aggressive in defence of his position. The rule says: "Any driver defending his position on a straight and before any braking area may use the full width of the track during his first move provided no significant portion of the car attempting to pass is alongside his. "Whilst defending in this way the driver may not leave the track without justifiable reason. "For the avoidance of doubt, if any part of the front wing of the car attempting to pass is alongside the rear wheel of the car in front this will be deemed to be a 'significant portion'." The incident at Monza on Sunday happened at the Curva Grande, which the drivers take flat out. Alonso went to the outside to try to pass the Red Bull and Vettel moved over, not leaving him a car's width of space. The Spaniard ended up with all four wheels on the grass but managed to control the Ferrari and get back onto the track. He passed Vettel on the inside in the same place three laps later, before the German had been given his penalty. Alonso said: "The race director makes the decision and they made one, but it didn't change anything because [Vettel] was forced to retire." 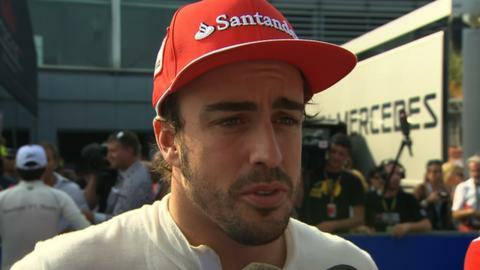 Asked whether there was enough respect between drivers, Alonso said: "I don't know. Sometimes yes, sometimes no. It's difficult for sure. It is in the borderline, this one." The incident was similar to one in which Vettel passed Alonso in the same place last year with two wheels on the grass. Then, not only was the rule not in place, but Alonso left just enough room for Vettel to stay on the track. Alonso said: "Last year there was not a penalty, this year there has been. I think there is a big difference for the people who understand this movement." Red Bull team boss Christian Horner said he felt the penalty was "harsh".